Welcome to North Carolina—the home of Krispy Kreme. What is Krispy Kreme, you ask? Please, let me enlighten you. Only the best doughnut, I’m talking the original glazed, yeast-raised, in the world. Vernon Rudolph opened the first Krispy Kreme in 1937 in what’s known as historic Old Salem in Winston-Salem, NC. Today, Krispy Kreme is sold internationally in supermarkets, retail shops and convenience stores. 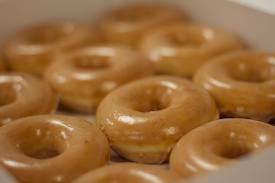 The Original Glazed is their best-selling product. But Krispy Kreme has a variety of yeast-raised and cake doughnuts for every palate and sweet tooth. Linden brings a box of doughnuts for Walker and the guys working on the quilt barn trail. She probably bought the doughnuts at the flagship store in Raleigh on Person Street. Every Raleigh resident, whether seven or seventy, knows the best Krispy Kreme doughnuts are to be had when the Hot Sign is On. And at the Raleigh store, you can watch through the glass-fronted window as they roll off the conveyor belt into a box just for you. And what do Raleigh citizens do for fun in February? 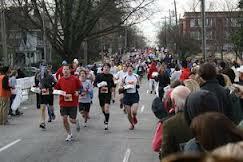 Raleigh residents take it a step further with the annual Krispy Kreme Challenge. Although not affiliated with the Krispy Kreme company, the charity race event raises money for the NC Children’s Hospital. Begun in 2004, runners eat one dozen doughnuts (let me break it down for you—that’s 2400 calories and 144 grams of fat). The one hour race originates at the North Carolina State University Belltower and concludes through scenic downtown Raleigh at the Person Street Krispy Kreme store. Yeah, and you can imagine the results. Only the die-hard enroll. The rest of us just enjoy watching our fellow citizens puke during the five mile course. Eight thousand participated in 2013. Almost $200,000 was raised. What’s your favorite kind of donut? This entry was posted in Beyond the Cherokee Trail and tagged #NativeAmericanfiction, #NorthCarolina, Beyond the Cherokee Trail, Krispy Kreme, Lisa Carter Author, Raleigh, romantic suspense, Southern fiction, Sweet Tea with A Slice of Murder by Lisa Carter Author. Bookmark the permalink.